This amazing heater can heat a place up to 400 square feet and this is more than enough for a portable heater. This easy to carry portable heater is safe for indoor use in small apartments and office places and also in various recreational enclosures. It can provide enough air for combustion and ventilation in enclosed cabins, porches, fishing huts, tent trailers, truck caps, tents, and vans as well. It may also be used for emergency room heating and to heat a small garage. The Mr. Heater Propane Big Buddy Portable Heater provides three different heating levels. In most of the heaters present in the market, we do not see this specific feature. Depending on the weather and the temperature of the room, you can adjust the heating level of the heater. Three heat control knobs- low, medium, and high are present to adjust the heat level so that you can get steady temperature condition in your room. Along with that, a large four position heat control knob is present for easy adjusting with gloved hands. We all need a comfortable heater to warm up the condition of the room when the weather is freezing outside. After returning from a day’s long work, you would definitely like to have a cup of tea and enjoy the amazing atmosphere created by the Mr. Heater Propane Big Buddy Portable Heater. Being small in size the heater fits in really well in your bedroom, living room or tent. You can select the required mode or heating level as per your convenience and then just sit back and relax. This heater can reach up to 400 meters and that is the ideal size of any living room or hall. Even for your workplace, this heater can turn out to be a handy option. One of the most important features of this item is that it can be carried anywhere. The compact size of the heater makes it really easy to fit in a car. If you are going for a trekking or camping trip, then you can carry the amazing Mr. Heater Propane Big Buddy Portable Heater with you. No matter how many people are there with you in the car, you will still find a tiny place for this little item. It can easily heat up a medium size tent and you will not feel like freezing, even when the temperature falls at night. To stay warm and comfortable, you should always carry this heater in all your trips. The company also takes care of accidental cases that may occur at any moment, as nobody got any control over that. The Oxygen Depletion Sensor or ODS is installed in the system and it keeps on checking the oxygen level in the atmosphere. This feature reduces the chance of accidents and thus ensures all the customers. The Tip-Over Detection System turns out to be very useful while going out for camping. As we all know, we cannot plan everything and no matter how much you get prepared for a trip, something unplanned will definitely happen. And, if in any such circumstances, the heater shuts itself off because of the Tip Over Detection System. You should never compromise when it comes to the safety of your family and friends and always choose the product that offers maximum safety. 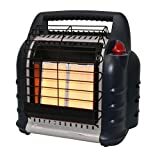 If you search various websites or nearby stores, you will find that portable heaters are not that cheap and they do not serve all your purposes. But, with Mr. Heater Propane Big Buddy Portable Heater you will get all the necessary features. Features like different heating levels, large heating surface, Oxygen Depletion Sensor, Tip-Over Detection System make it the best portable heater to use both at home and also for camping. Since it is a portable heater you can carry it anywhere you go. It is not that heavy and does not require much space. All these features make it one of the best portable tent heaters in this price range.